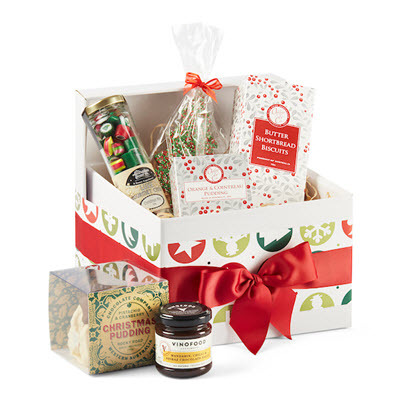 Christmas is just around the corner and what better way to celebrate than with a hamper full of gourmet goodies! These eight Christmas hamper ideas are perfect for every type of celebration, with products to suit most budgets as well as alcohol and gluten free options. If you prefer one of our everyday hamper arrangements, we can also wrap it in Christmas style and deliver it to your preferred location. Every order above $50 includes free delivery within the Perth metro area. We also ship Australia wide – so get in early to book your delivery just in time for Christmas. Whether you’re after a gift for your family, friends or work colleagues, these Christmas hamper ideas are sure to impress. The Blitzen Bonanza is a great starter hamper with a mix of chocolate gourmet treats. Its affordable price and popularity makes it the perfect addition for friends or ‘Secret Santa’. 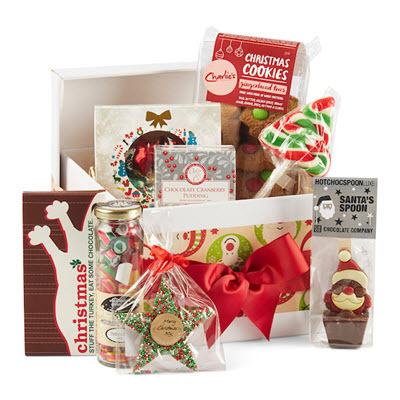 This Christmas hamper is the ideal choice for kids and those with a sweet tooth. It’s packed with delicious gourmet cookies, lollies and chocolates and comes wrapped in a festive gift box. Dasher’s Delights is a medium sized hamper which includes Christmas cookies, chocolate and puddings. It’s cake and dessert sauce make it the perfect choice for the dessert lover in your family. Festively wrapped for the holidays, ‘No Missing Out at Christmas’ has decadent treats for a refined taste. This is a great hamper idea for the gluten-free and health conscious. Comet’s Connoisseur Collection is a premium gift hamper packed with treats and drinks. 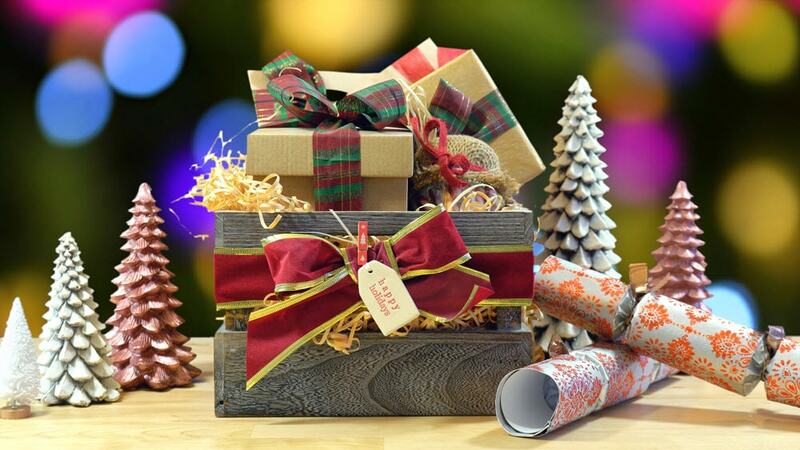 Wrapped in a large gift box with your choice of alcohol, it’s the perfect gift to help celebrate the holidays. For those who aren’t interested in alcohol, the Festive Entertainer offers indulgent alternatives. 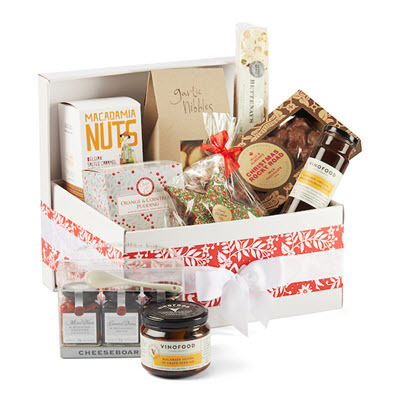 The hamper is filled with both sweet and savoury gourmet treats and comes packed in a large Christmas box. If you’re looking for a dark and rich taste, the Divine Decadence Christmas hamper may tempt you. 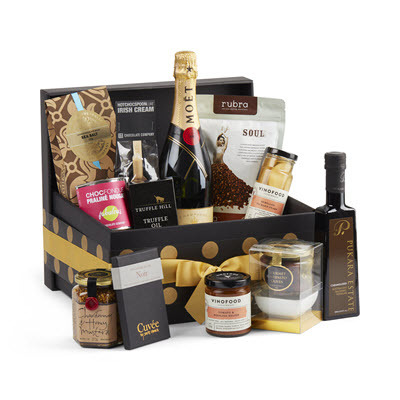 Dark chocolate, coffee and quality condiments are just some of the gourmet items in this hamper, with a premium bottle of champagne, wine or spirits of your choice. The Christmas Opulence is a top-of-the-line hamper, for when only the best will do. Featuring our most awarded gourmet foods and the highest quality items, why not spoil family and friends or treat yourself. 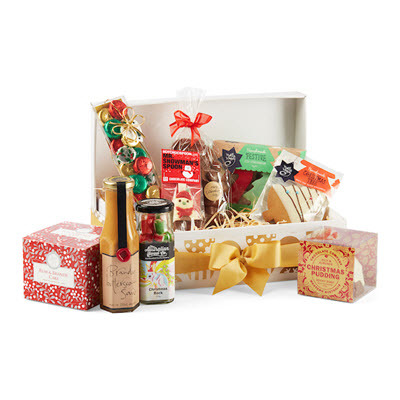 If you’re thinking of designing your own Christmas hamper, look no further! 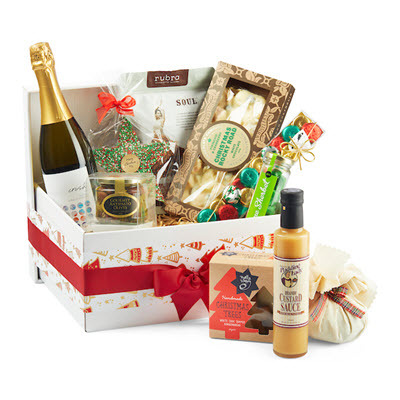 Visit our ‘Create Your Own Hamper’ page to build your perfect gift hamper. Simply browse our list of gourmet products and click the ‘add to hamper’ button to start filling your hamper. You can sort by ‘Christmas treats’ as well as filter by recipient. 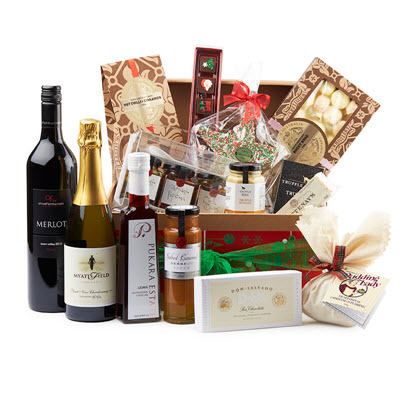 Make Christmas gift giving easy this year with a custom or pre-designed hamper from Just In Time Gourmet. For help or more information, contact one of our friendly team today. Thanks Alex, bit hard to resist aren’t they?